One of the best parts about having a blog is the opportunity to engage with people about some of the things I’m thinking about, and to make each other think. That’s why this week, I’m going to talk about a topic that’s been on my mind for a while now: the autonomous vehicle. A Ford Explorer is the car I drive daily, but in full disclosure, I bought a car that has fully autonomous features. That might shock a lot of you, but the way I think about it is kind of like one of my favorite scenes from The Hunt for Red October. A couple Russians are speaking while Alec Baldwin, an American, is in the room. To their surprise, Baldwin starts talking in Russian, too. When asked why he knows Russian, Baldwin says that it’s wise to know his enemy. That’s kind of how I feel about autonomous vehicles. In a way, they’re my greatest adversary as a race car driver, so I want to know everything I can about them. In the Hunt for Red October, Russian Alec Baldwin takes pride in knowing his enemy. With my own autonomous car, I use the adaptive cruise control a lot (basically, a kind of autopilot), the radar for parking, and the parallel park functions. The car does pretty well in traffic on the freeway, so that’s cool. But at the end of the day, it’s kind of confirmed what I was already feeling about autonomous cars in general. It’s worth saying that my own opinion here kind of makes me laugh because I generally don’t have a lot of patience for people who are overly pessimistic. But I am of the opinion that the autonomous vehicle will never succeed in the United States, and at least part of how I feel comes from being a race car driver. Twenty years ago, cruise control would have basically been autonomous. 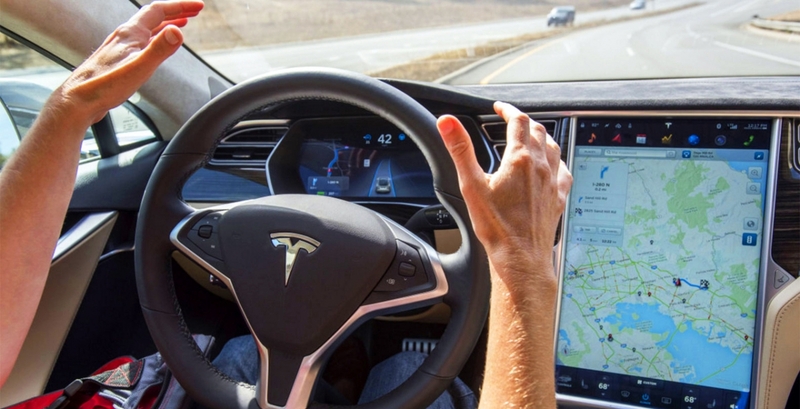 Today, people think of the Tesla autopilot as autonomous. People think of the Tesla as an autonomous car. For millennials, autonomous basically means, “I don’t have to do anything.” You can listen to music, play the air guitar, read on your iPad, and not do anything behind the wheel of a car. You just get in a car, push a button, and go from point A to point B without having to do anything to get to your destination. The car does everything. It’s what the car executive would have called a level five. That’s the version I’m going use for this discussion: the fully autonomous vehicle. As a race car driver, I deal with situations all the time where I have to see things coming before they happen. Talladega is kind of a perfect example of that. Being able to run a race at Talladega is all about quick reactions, predictive analysis, and the ability to step in before something goes wrong. I try to see a scenario two or three laps before it’s going to happen. I try to be prepared for it, and to be positioned for it not to affect me. Imagine that you’re in a car, and you’re driving behind a truck carrying a bunch of logs. There’s a log on the pile that’s loose, and looks like it might fall off. An autonomous vehicle’s sensors aren’t going to pick up something that hasn’t happened yet but might. You would. If you were driving the car, you’d simply get in another lane, and pass that truck before anything happened. That’s a lot like being a race car driver (though again, we’re doing all of this at 200 mph). You’re putting yourself in situations or getting yourself out of situations that you see coming. Computers and algorithms can make calculations at lightning fast speeds, but there are still tremendous advantages the human mind has. We can draw on our experience, and in many cases, still process situations faster and more thoughtfully and accurately than an autopilot could. So that alone seems like a reason why you wouldn’t want to remove the human element from driving completely. Another big strike against autonomous vehicles is that to some extent, they’re going to have to rely on our country’s infrastructure system to be successful. There are plenty of reasons to think that will be problematic. 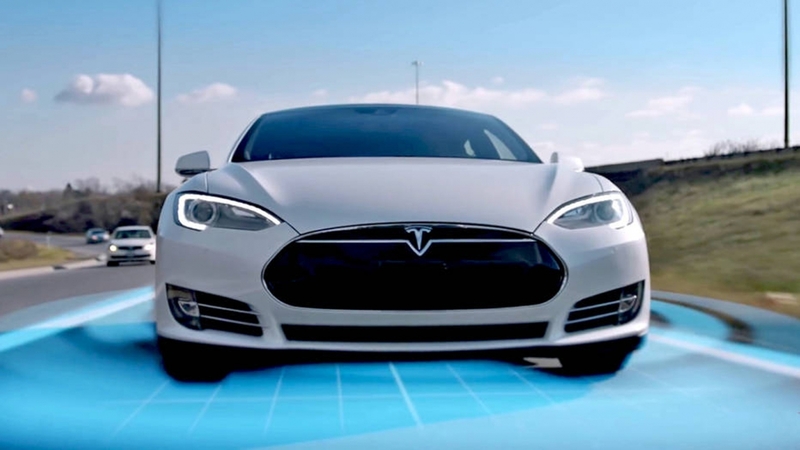 The Tesla’s autopilot, for example, relies on sensors being able to read the road. When they do that, they pick up on things like lane markers. They’re affected by the type of pavement you’re driving on. Whenever there’s construction—and I’m not sure what things are like where you live, but there’s always construction going on where I’m at—we put up jersey barriers and yellow cones. Sometimes there aren’t any lines painted on the ground at all because they’re tearing up the pavement. Or there’s fresh pavement, but the lines are all crooked and painted wrong. There’s basically two different ways that autonomous cars can “see” the road. There’s a mostly GPS-based model that relies on super detailed mapping, and there’s a mostly camera-based model that actually relies on special cameras and sensors (visual, infrared, etc.) on the cars themselves. Unfortunately, both of these can be messed up pretty easily, and the things that cause them problems are very real, and not easy to fix. Going back to the infrastructure issue, GPS-based mapping can’t handle changes that occur to roads. So if there’s construction, for example, the car gets thrown. I remember hearing that in one test run of autonomous cars, a car got stuck at a stop sign because it had moved a few feet, and was at odds with the GPS information the car was using. The car read the sign’s new location as an obstruction, and refused to move. A car having a mind of its own isn’t necessarily a good thing. In the same way, cameras stop functioning well when things like weather conditions change. A snow covered road, for example, doesn’t have things on it like lane markers. It basically renders the technology that an autonomous car would rely on essentially useless. I experienced the limitations of this tech first-hand not that long ago. I drove to Darlington in autonomous mode on a perfectly clear day, and it was a complete disaster. The road I was on for a lot of the drive was a divided highway with u-turns set on the left side of highway at regular intervals, so the lines in the road were drawn differently. Literally every time we passed a u-turn, the car went crazy and tried to pull left. I could not drive the car in the left lane in autonomous mode. This is another big question that is really, really tough to answer. If there’s an accident with an autonomous vehicle, who’s at fault? Who’s going to pay the bill for the damages? What happens if the autonomous system doesn’t see something that the average person would have, and someone gets hurt or killed? Would you blame the auto company for not writing a better algorithm? If there’s a lawsuit every time an autonomous vehicle fails, it seems like it would cripple the industry’s ability to make those cars, and remove a lot of financial incentives to do so. It’s a tremendous challenge to figure out the liability side of things. Not that long ago, I had two interesting things happen in vehicles I was traveling in. The autonomous sensors failed in my car, and a part broke in my airplane right in the middle of a flight. The difference between the two failures added another dimension to why I don’t believe an autonomous vehicle will ever work. When my airplane broke down, it lost a circuit board that runs the batteries in the plane. But it had two boards. The airplane was able to keep flying. We landed immediately, and got the part repaired. We were able to do that because airplanes are built with a culture of redundancy. The premise behind that is it’s better to be broken down on the ground than in the air, wishing you were on the ground or worse. If you have a redundant system, when one critical system fails, you stop flying, and get to the ground. Redundant systems are very expensive to build, which is why the automotive industry generally doesn’t build cars with redundancy. For the most part, there is one system of everything in a car: one engine, one battery, one set of controls. Automotive culture is if one thing breaks, hopefully it’s something that you can get fixed easily. You just stop somewhere on the side of the road, call AAA, and move on. To make autonomous cars truly safe, I think you’d have to introduce at least some level of redundancy in a few different areas. You’d also need costly safety and maintenance checks. That would make cars a lot less affordable, which in turn removes an incentive for building them. There are a bunch of other issues that come up with autonomous cars that could probably merit their own sections. If computers are running the show, that opens them up to being hacked, and who knows what happens if people are able to take over the controls of autonomous cars. There’s also the reality of American car culture: People still love to drive their cars, and they love to watch their favorite drivers race, too. But you know what? I could be dead wrong here. Twenty years from now, they might come out with a fully working autonomous vehicle. Yes, I’m a race car driver and somewhat of an expert when it comes to being behind the wheel, but there’s a lot more to this than that. I definitely don’t have all the answers, and quite honestly, I’m just as interested to hear what you think. So what do you think? Post your thoughts here in the comments on my site, or on Twitter and Facebook with the hashtag #DriverlessCarBlog. Just wanted to say ,when you don’t want drive anymore you would be a fabulous announcer..You’re a natural.Great job. and let’s pray we never have to worry about selfless driver race card.And good luck on Daytona. I expect we will see an autonomus car race in the next few years even just to prove the technology. Also expect a lot of product testing to occur in autonomus mode since it can provide consistancy on repeated tests. Maybe even Goodyear NASCAR tire tests using some autonomous cars. For me, my next car will have a lot of safety autonomus features but I will only use full autonomous as curiosity once or twice on known open highway. I like the idle of sensers that would help our commercial driving work force. Having the drivers communicate what would help make the roads safer. Better maping with warnings of the road conditions ahead sharp curves with speed recommendations along with road grade. Brake temperatures so they don’t overheat the brakes. Sense that can tell if a driver has fallen asleep. This to me would be a better than a driverless car. I think the biggest challenge to self-driving cars is their current inability to respond to weather conditions. I think that all vehicles could be autonomous in 20 years simply because technology is advancing so quickly, but as you mentioned the issues of liability will be tough to solve. The U.S. also has a strong car culture that mirrors our values of freedom and independence, but I’ve experienced some traffic this year that made me wish I had a self-driving car. LA, DC, and New York are total gridlock much of the time and a potential solution to this issue is autonomy where cars could operate inches from one another without incident. I think we will see a very gradual transition to autonomy. The transition will begin with the big rigs on the super highways, then move to all passenger vehicles on the super highways, and eventually spread to two-lane highways and local roads.